Overlooking the many other reasons for watching Jabberwocky, the one to top them all — at least, for the more hardened and enthusiastic cinephiles — is the fact that it marked the solo directorial debut of Terry Gilliam. That alone should be reason enough to immediately hunt down this 1977 gem, spending time analyzing the unadulterated absurdity of a unique filmmaker while reveling in the bonkers, over-the-top inanity of a nonsensical plot. 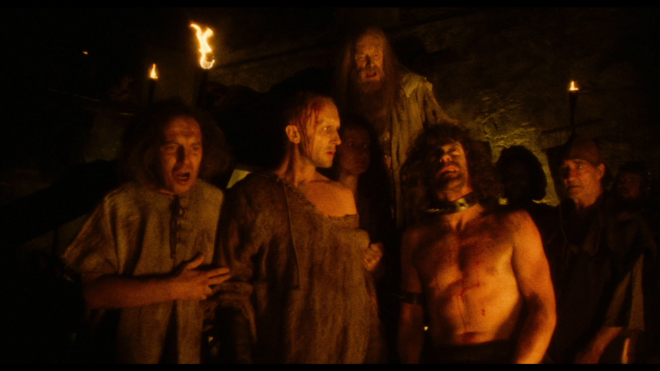 Some will be quick to making comparisons with Monty Python and the Holy Grail from a couple years earlier and which Gilliam co-directed with Terry Jones, and they wouldn't be wrong since there are few moments that feel arguably borrowed. However, more astute viewers and ardent fans will note the making of Gilliam's brand of zany wit and chimerical curiosities, his interest of placing hapless heroes in a wacky yet considerably serious situation that escapes their control. 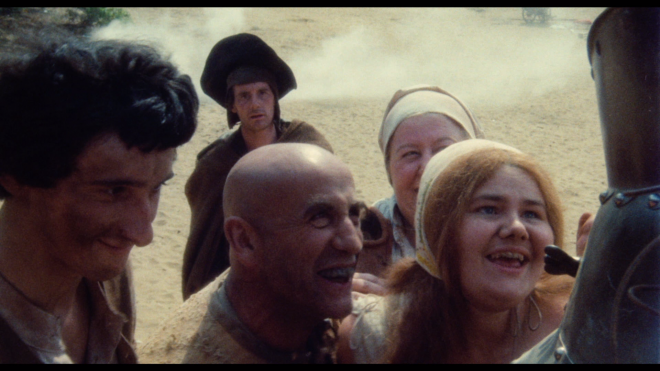 Though somewhat rough and artless around the edges, the camerawork displays the initial stages of a filmmaker with a fascination for history told with a mix of wide-angle shots, unusual close-ups and goofy surreal visuals. Much like the Lewis Carroll poem that inspired it, the slapstick fantasy fable is ultimately complete gibberish, playing out like a deliberate situational comedy where scenes can serve little purpose in driving the story yet pay off bigger laughs later down the line. 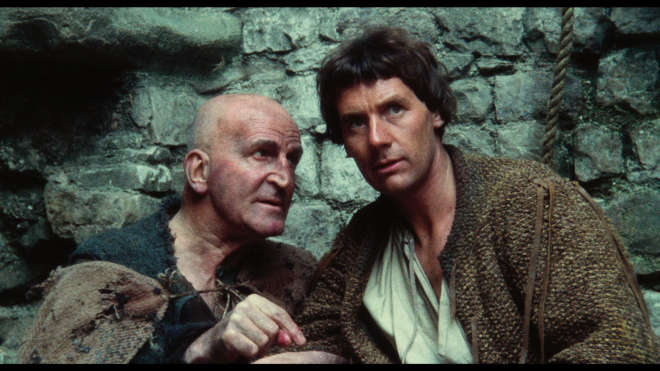 Michael Palin stars as our luckless but happy-go-lucky hero Dennis, a plucky, optimistic man with aspirations to make his father's cooper business a success and escape his poverty-ridden rural existence in medieval England — or as the narrator refers to as the really dark, dark ages. He also fancies marrying Griselda (Annette Badland), daughter of the local fisherman and the town's most upscale family. Their house comes with a toilet, which is really a hole in the wall where a person can sit comfortably over the same lake Mr. Fishfinger (Warren Mitchell) catches fish. After Dennis's father unexpectedly passes away, and to prove he can be someone important to his intended, he takes the arduous pilgrimage into the big city — the castle of King Bruno the Questionable (Max Wall) — a whole two miles away. Don't judge! For people of this period, that was quite the grueling, half-day's journey. The production's enjoyment partly arises from this sort of anachronistic silliness and the sometimes easy to miss wisecracks, a comedy that feels reminiscent, if not blatantly influenced, by classic Looney Tunes and Merrie Melodies cartoons. The jousting tournament to find a champion who will battle the titular monster terrorizing the kingdom features scenes of a black knight defeating each challenger. Their bodies fly in every direction or vanquished in goofy combats of carnage while buckets of blood shower the king and his daughter (Deborah Fallender), who sits at his side visibly grumbling and bored — as a teenage girl is wont to do when promised as the prize of the tournament. Meanwhile, Dennis is sidetracked from his original plan when unwittingly stumbling into the area meant only for squires and knights. Discovering city-life is tougher and more disparaging than his previous rural existence, the always-optimistic Dennis finds every opportunity to express his unsolicited advice for improving productivity. But a professional squire (Harry H. Corbett) tries to correct him of this habit to only introduce him to more problematic misadventures of living in the city. True to the Monty Python style, Jabberwocky overflows with the dry visual gags, deadpan dialogue and screwball cosmic irony audiences have come to expect of Gilliam — or anyone from the Python crew, for that matter. Soon after his arrival, Dennis is advised by a renowned cooper that being a beggar is more profitable, so long as he's willing to make a small sacrifice. And a pair of medieval soldiers at the castle gates suddenly turn sappy and weepy at the sight of Dennis's rotten potato. But all the madcap lunacy on display is not without its share of finespun insight, cleverly weaving this silly tale with some shrewdly-hidden wisdom. Dennis wanders through the city — modern-living in the eyes of the poor country sap — like a bumbling everyman, but his efforts and determination to succeed continuously go unnoticed and largely unwanted in the face of a great monstrous threat. The road for fortune and prosperity, one leading him reluctantly to the dangerous creature, is paved with happenstance and dumb luck. Ultimately, the wacky tale toys with existential questions without seeking answers, leaving it at life being a meaningless series of fortuitous accidents, ideas Gilliam later explores further but introduces to his audience in first solo outing. 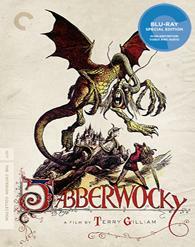 This Blu-ray edition of Terry Gilliam's Jabberwocky comes courtesy of The Criterion Collection (spine #903) on a Region A locked, BD50 disc and housed in their standard clear keepcase. Accompanying the disc is a foldout pamphlet with an insightful essay entitled "Through the Looking Glass and What Terry Found There" by film and television writer Scott Tobias. There are no trailers or promos before being greeted by an animated menu screen with the distributor's usual options and music playing in the background. According to the accompanying booklet, the high-def transfer was struck from a 4K restoration and remaster of the original 35mm camera negative. This was in conjunction with BFI National Archive and The Film Foundation, and the results, approved by Terry Gilliam, are pretty fantastic. Bearing in mind its production history and budget, the source has aged incredibly well. It may not compare to other films of the same period, but the 1080p/AVC MPEG-4 encode is a vast improvement over the DVD from 2013. Presented in its original 1.85:1 aspect ratio, the video comes with great definition in the clothing and the surrounding foliage, exposing the textural details of the fabric in the costumes and the fine lines in the leaves and the bark of trees. The individual stones of the castle are distinct, revealing every crack, pit and pockmark of the walls, and the filthy, dirt roads seem particularly grimy. However, the presentation also comes with a fair share of soft, blurry moments and several scenes are poorly resolved, likely related to the condition of the source rather than an issue with the encode. Contrast is on the lower end of the grayscale, making the picture a bit drab and gray, but whites are crisp and brilliant. Black levels are deep and accurate while every nook and cranny remains visible in the darkest shadows. The palette is somewhat restrained but vibrant nonetheless with more emphasis on warm, cleanly-rendered secondary earth tones. 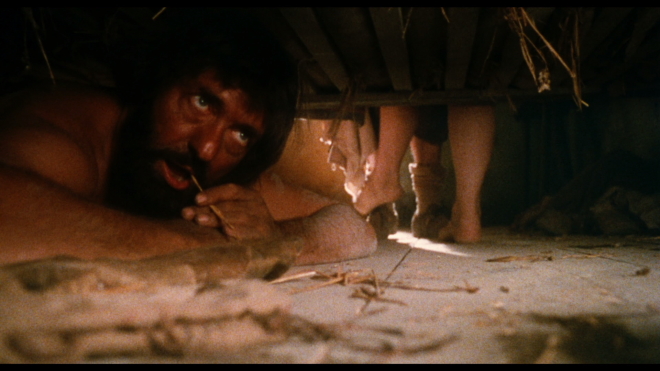 In the end, the Gilliam favorite looks great on Blu-ray, awash with a thick, visible layer of natural grain, providing it with an appreciable film-like quality. Much like the video, the film's monoaural soundtrack has been restored from the original magnetic multi-tracks, and the new remaster fares much better than the picture. However, owners are only given one option, which is a DTS-HD Master Audio 5.1 track. This is rather unfortunate and somewhat unexpected because it would be nice to enjoy the original mono design and since I'm not usually the biggest fan of such drastic alterations, preferring instead to preserve a film's quality and history. Nevertheless, to my shock and amazement, the new surround sound remix is a surprisingly excellent upgrade, creating a broad and expansive soundstage with lots of background activity. With an extensive mid-range delivering precise clarity and detailing in the higher frequencies, imaging is continuously engaging, swarming with a variety of convincing off-screen effects moving fluidly between all three channels. The lossless mix also comes with remarkable directionality as the sides fill the room with the soothing sounds of local wildlife. Birds are almost always chirping in the distance while the voices of people crowding the bustling city expand the soundfield. Occasionally, other random atmospherics effectively pan from one speaker to the next and lend themselves nicely to the overheads for an awesomely cool immersive experience. The dialogue is precise and distinct with outstanding intonation, allowing the listener to enjoy every hilarious line and ridiculous conversation. The low-end is shockingly impactful with appreciable weight and depth. Audio Commentary: Ported over from the DVD, director Terry Gilliam and Michael Palin reunite for this highly-amusing conversation where the two friends continuously joke back and forth while swapping witty anecdotes from the production, discussing the plot's inspirations and sharing their thoughts on the themes. Jabberwocky: Good Nonsense (HD, 41 min): Entertaining and decently exhaustive retrospective featuring brand-new interviews with various members of the cast & crew discussing several aspects of the production. 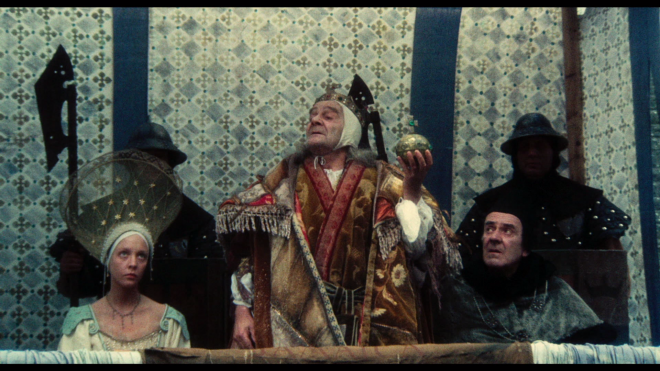 Terry Bedford (HD, 22 min): A 1998 audio interview with the director of photography conducted by writer David Morgan chatting about the look and style of both Holy Grail and this film. Valerie Charlton: The Making of a Monster (HD, 15 min): An informative interview with the production designer, the person largely responsible for the design and creation of the Jabberwocky. Original Opening (HD, 3 min): The original opening edited for U.K. audiences. Sketch-to-Screen Comparison (1080i/60, 7 min): Slideshow concept designs, sketches and storyboards. Lewis Carroll's "Jabberwocky" (HD, 2 min): A delightful reading of the original poem by stars Michael Palin and Annette Badland. Jabberwocky is a delightful 1977 gem that marked the directorial debut of Terry Gilliam, which is reason enough for cinephiles to immediately hunt down this wacky cult comedy. Although a bit rough around the edges and occasionally feeling like an extension of Monty Python and the Holy Grail, Gilliam's first solo outing nonetheless displays the filmmaker's unique brand of witty zaniness and chimerical curiosities, a great time for devoted fans to revel in the unadulterated absurdity and bonkers inanity of a nonsensical plot. The Blu-ray from The Criterion Collection arrives with a notable audio and video improvement over the previous release, which fans will surely appreciate. Along with a healthy and entertaining assortment of supplements, the overall package is very much recommended!